Watching cake decorating slideshows not only provides you a manual for learning techniques and tips, but also helps you brainstorm new design ideas for your next cake project. Slideshows provide a visual tool for cake decorators. Regardless of how eloquently or accurately written, a photograph clarifies the author's idea when it comes to cake decorating. As a tool, slideshows are especially helpful in showcasing not only new cake design ideas, but also tips for making frosting smoother or piping the perfect rose. Looking at cake decorating pictures sheds a light on a technique that you may have struggled with when you read written instructions elsewhere. 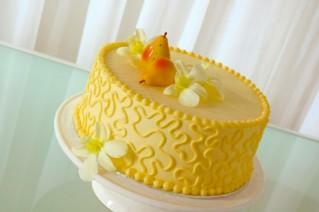 You can flip through slideshows to find new ideas for buttercream or fondant cake designs. Even if you do not use the entire idea, you can always combine elements from several cakes to create a unique pattern all your own. Read the slideshow text thoroughly. While visuals are helpful, you want to find out exactly what type of frosting was used or icing technique was employed in making the design you see in the slide. Use the "Pause" button to stop automatic slideshows at any time. Sometimes a slideshow may move too quickly for you to read the entire description or thoroughly study the technique. Pausing the slideshow is the perfect way to get all the information you need without having to replay the show over. Enlarge the pop-up slideshow window. This way, you can be sure that you see the entire slide at once, along with the buttons at the bottom. Follow links on the last slideshow to find informative articles on topics you are interested in learning more about. The blue text clues you in to the linked article's text. Have a pen and paper handy when watching slideshows to take notes on various design ideas or skills you want to incorporate into your next cake.